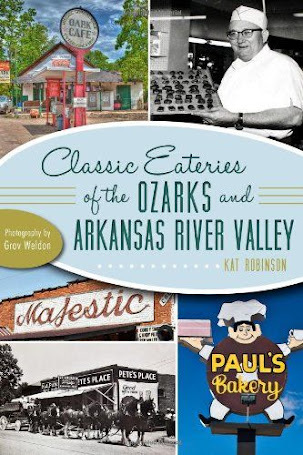 Fried chicken in Arkansas: History, second helpings and hints. Ozark Folk Center in Mountain View. Pan-fried, deep-fried or pressure-fried—we love our fried chicken. Born of similar dishes brought to the south by both African and Scottish ancestors, the traditional fried chicken served as “Sunday’s best” generations ago remains on the table as the crispy-crusted comfort food of the South. But as for how the bird came to roost on the dinner table, that's a story and a half. 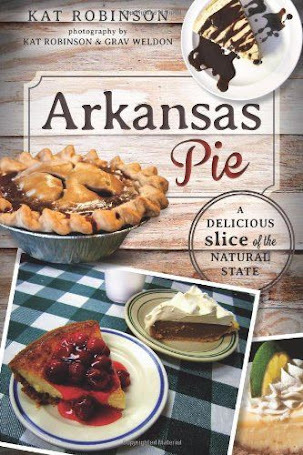 How did Arkansas manage to absorb the epicurean staple? Before this land was settled by immigrants, the cuisine of Native Americans was based on what was available—and that varied by region. 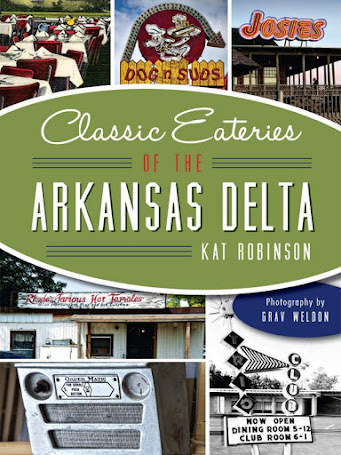 Settlers introduced pork, since pigs could root about anywhere, whether in Delta mud or on rocky Ozark plateau, and they consumed everything from table scraps to roots they dug up. And then there were chickens. Yardbird was more highly prized in earlier years for eggs than meat, but for those special occasions, chicken came to the table. Why fried? That’s a good question. Most settlers from Europe were accustomed to having their chicken roasted or stewed—traditions that date back from Roman times. 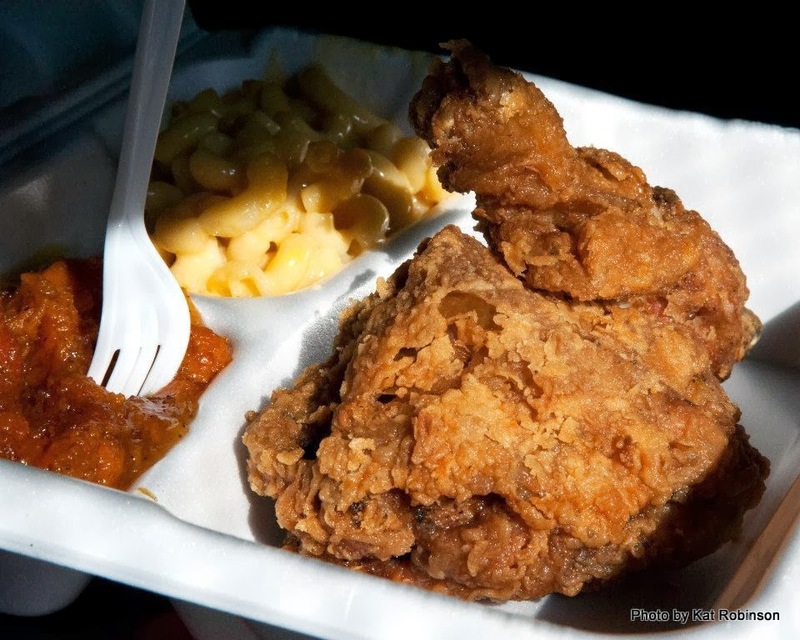 The Scottish folk, however, are believed to have brought the idea of frying chicken in fat to the United States and eventually into the Arkansas Delta in the 18th and 19th centuries. Similarly, African slaves brought to the South were sometimes allowed to keep chickens—which didn’t take up much space—and when they flour-breaded their pieces of plucked poultry, they paprika-popped and spice-saturated the meat before putting it into the grease. And the grease? Well, it’s less time consuming and requires fewer resources to heat lard or oil in a cast iron vessel over a fire or on top of a stove than to bake something inside. Hence, that propensity for jointing and processing chicken with the skin on, dipping in flour and buttermilk and egg and dropping into a hot skillet of grease or lard took hold. If you are lucky, there’s someone in your family who loves you enough to fry you your own chicken. But we’re a state (and by extension a nation) of folks who have less time than we’d like, and we tend to want our fried chicken provided by a reputable restaurateur. More often than not, I fall into the latter cateogry, and have therefore had my fill of bird from the left and right, north and south of this great state. The best I have found is that offered by one Ms. Rhoda Adams, the proprietress of a little humble place called Rhoda’s Famous Hot Tamales in Lake Village at the southeastern corner of the state. 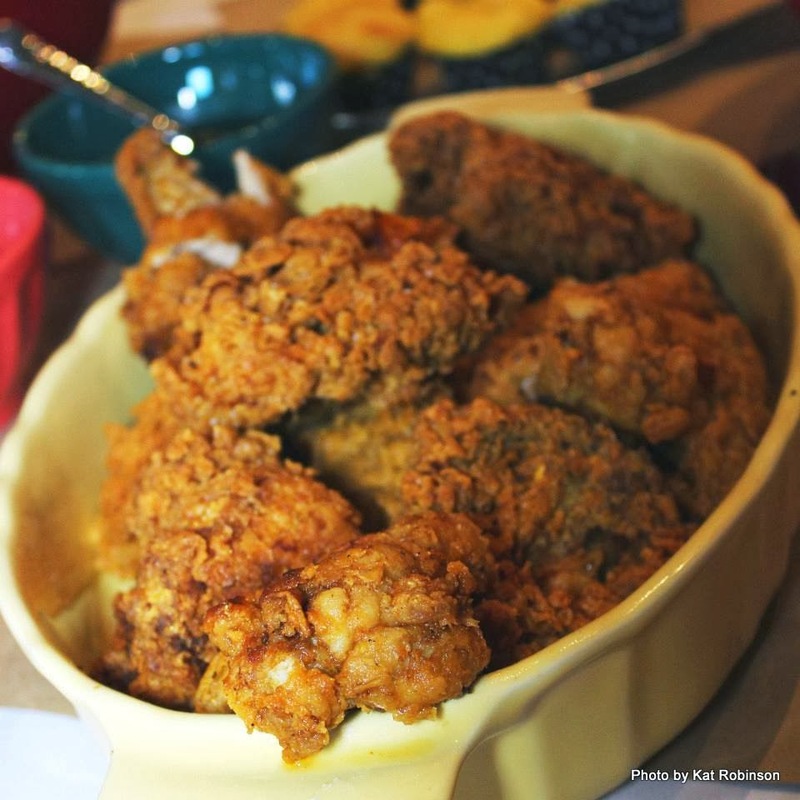 Although known far and wide for those tamales and equally wonderful pie, the true humble masterpiece of Ms. Adams’s kitchen is fried chicken. Salty, juicy and an orange gold—this bird is meant for consuming with white bread and sweet potatoes, preferably with sweet tea. buffet at JJ's Cafe in Lake Village. The town on the whole is tight on local restaurants, with just a few joints to check out amidst the regular chains. One of those places is JJ’s Café, which used to be JJ’s Lakeside Café before it settled in a little closer to the heart of town. Thin on the crust, this bird is built on a bundle of black pepper and paprika, and is usually served on the buffet with creamed potatoes, white gravy and green beans. The "Eye-Talian" Dinner at the Tontitown Grape Festival. Lake Village is where another strain of the fried chicken gene popped up in the heredity of our gastronomic identity. That’s where a group of Italian immigrants tried to make a home at the end of the 19th century. These folks found work and lodging as tenant farmers on the Sunnyside Plantation, but found life there harsh and cruel. Some 40 families chose to follow Father Pietro Bandini out of the Delta in 1898. They traveled to the north and west and braved through the Ozarks and the Boston Mountains to settle in the northwest corner of the state. The town they founded, Tontitown, was named after 17th century explorer Henri de Tonti. They grew apples, peaches and strawberries and whatever vegetables they could get to force up through the rocky soil—and eventually turned to grapes. at the Tontitown Grape Festival. 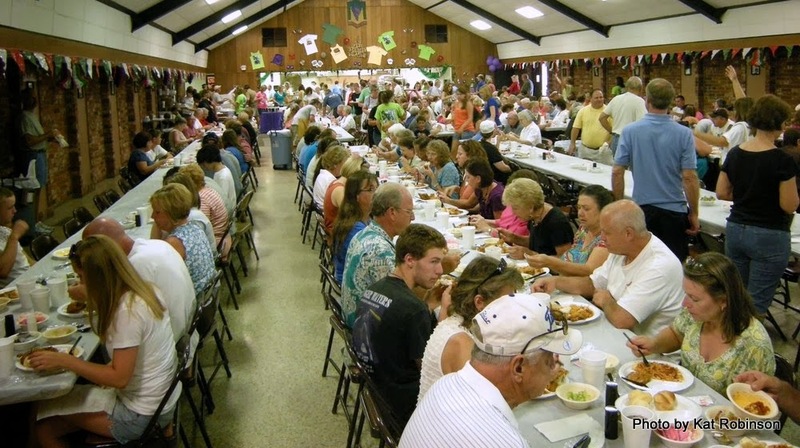 Of course, we all know today about that grape tradition—and how the community celebrates each August with the Tontitown Grape Festival. And that couple-year stint in Lake Village rubbed off on those traditions, too. At the festival’s multi-night “eye-talian” feast, fried chicken (a recipe learned from their south Arkansas neighbors) is served along with spaghetti noodles made the way they were when those past generations were still in Italy. 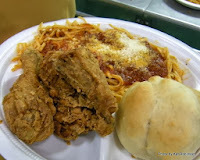 But the festival’s not the only place where you can enjoy the Ozark standard of fried chicken and spaghetti. 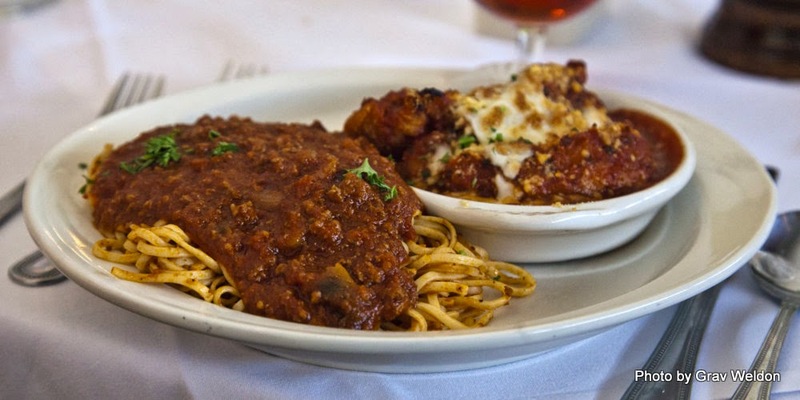 The Venesian Inn is likely the best known of the batch (now that Mary Maestri’s has moved to Springdale). It still serves, after all these years, crusty blonde chicken served up with a pile of spaghetti covered in that slightly runny marinara, which most of us top with a healthy dusting of Parmesan. Fat, shiny rolls are the best way to consolidate the grease to keep it from dribbling from the fingers. 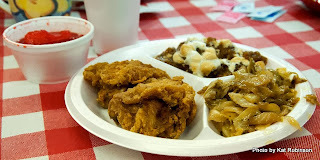 The AQ Combo at AQ Chicken House in Springdale. 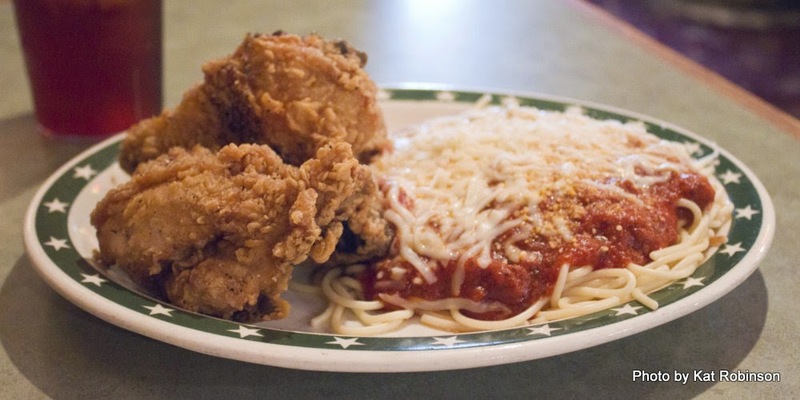 Nearby in Springdale, the AQ Chicken House is still dishing up its original, lemon pepper-enhanced bird after 76 years—even in its traditional AQ Combo, which includes spaghetti under marinara which is topped with a more than adequate melted conglomeration of mozzarella and Italian-blend cheeses. The rolls here are wheaty, but the chicken is distinctive, with a strong and almost acidic flavor that identifies every bite with the location in which it is served. 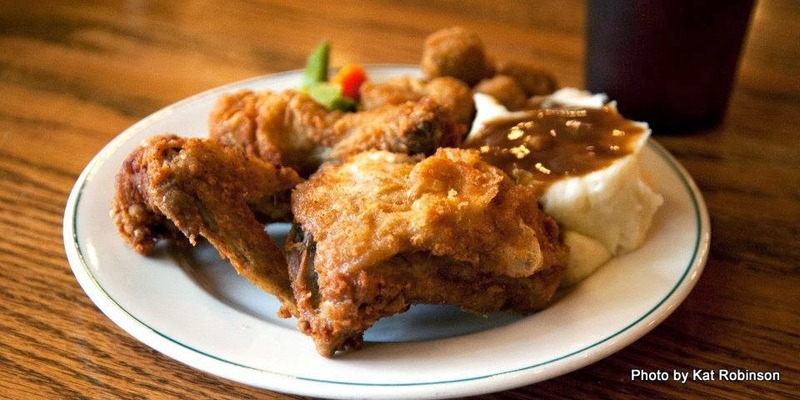 AQ, which stands for Arkansas Quality, also serves a couple of other varieties of fried chicken—a smoky barbecue sauce-laden version and its “chicken over the coals”—but neither are as welcome. Catty-corner down the road in an old pink diner, you’ll find Neal’s Café and its own interpretation. 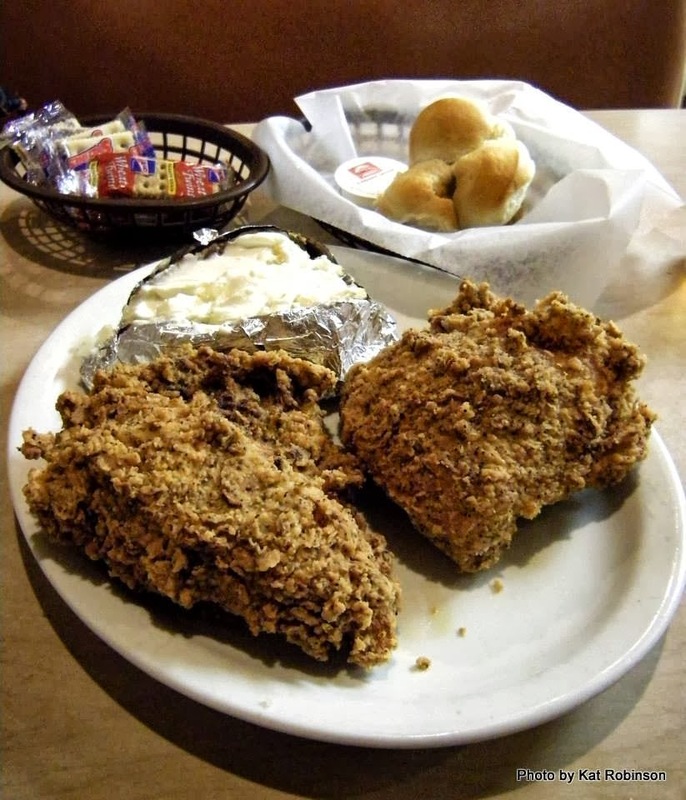 Still serving “the best of better foods,” Neal’s offers its chicken fried golden brown with potatoes and green beans, and it still proudly pan-fries every piece. Inn Chicken Restaurant near Rogers. 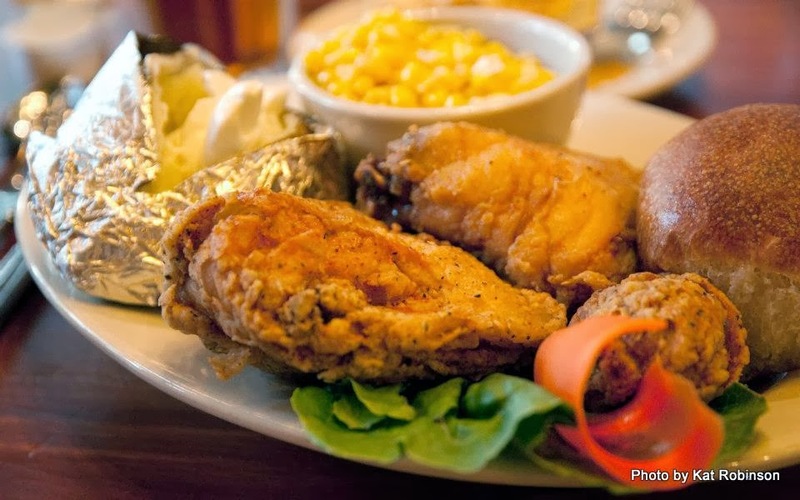 The real chicken dinner experience, though, comes outside Rogers at a little place off Beaver Lake—the Monte Ne Inn Chicken Restaurant. Named after the passed-on resort partially swallowed by the lake, the low-slung building houses what could be the best fried-chicken experience in Arkansas. You’re seated at a table—with your party, or if you’re alone you’ll likely share with strangers—and food is brought out in bowls, starting with a crock of bean soup. 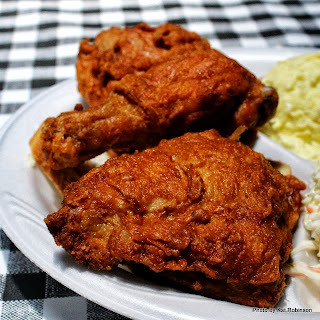 String beans, corn, mashed potatoes, gravy and coleslaw are delivered, along with small containers of apple butter and creamery butter and a fresh, soft loaf of bread—and a platter of fried chicken, deep brown-red with a tight skin and an impossibly juicy interior. You need reservations if you go. 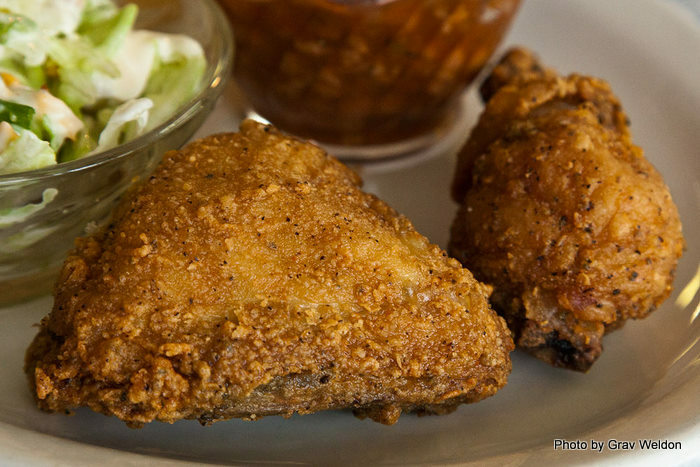 One of the state’s oldest fried chicken operations started in the 1920s not far away in Eureka Springs, in the front room of a house that belonged to a woman named Myrtie Mae. When travelers would come through the gap from the west, she was ready. Guests would knock on the door and Myrtie Mae would seat them in the front room. She’d head to the back, behead a chicken, pluck it, batter it, fry it and serve it up with creamed potatoes, gravy, vegetables and fresh bread—all in about an hour’s time. There aren’t any chickens behind the Best Western Inn of the Ozarks where Myrtie Mae’s Restaurant (contact TK) is housed these days—but the chicken is still marvelous, no heat or spice to it, just simple chicken in simple crust. All through the Ozarks today, you can still find great fried chicken at places like the Ozark Café in Jasper (usually white meat and deep fried) and at the Low Gap Café at Low Gap (pan-fried and peppery). Fried chicken plate at Bobby's Country Cookin' in Little Rock. 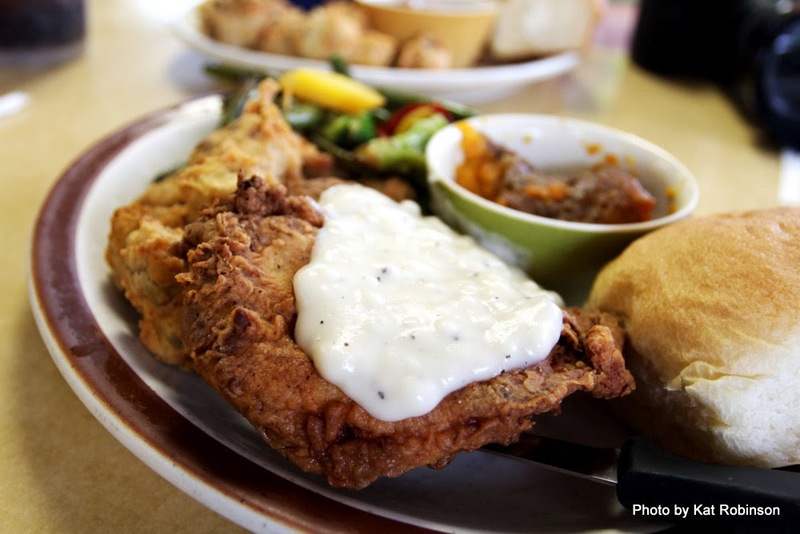 With fried chicken coming in from both the northwest and the Delta, you’d figure that Central Arkansas would be almost like the confluence of chicken. Sadly, this isn’t the case everywhere. The big chains like KFC and Popeye’s have found us here, and the demand for more places that serve a bird battered and deep fried is lower. But that doesn’t mean there aren’t good places to find the dish. Of them all, David Family Kitchen has to be my favorite. 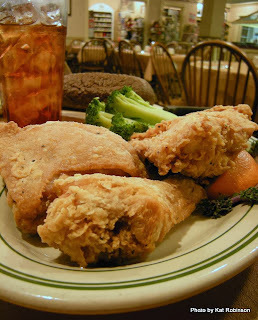 Offering soul food at its heartiest, the old-school restaurant on Broadway serves its chicken up fat and juicy. I mean it—probably the fattest chicken legs and thighs I have encountered came to me on a Styrofoam plate placed on one of those red tabletops. Salt and pepper in a buttermilk batter make for fine fried chicken, no doubt. at Capital Bar and Grill in Little Rock. 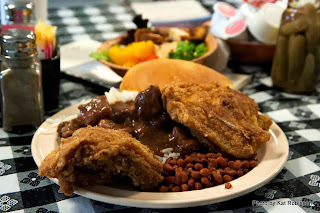 Your Mama’s Good Food and Bobby’s County Cookin’ both hold their own in this battle, and both deserve to be on any list. But if there’s any contender to the marvelous David Family Kitchen chicken, it’s the white-collar soul of Capital Bar and Grill. Only available on Wednesdays, the chicken has the flavor of a long soak and brine, with little grease and surprisingly thin crust on the bird. Steady and slightly sweet (is there tea in that batter? ), it’s perfect. Plus the potato salad is addictive. Three piece dark at Gus's Fried Chicken in Little Rock. Of course, thousands have made pilgrimage to Little Rock now for what was once a Memphis-only dream: that of a bite of the sharply peppered Gus’s World Famous Fried Chicken. Years ago, I had a chance to speak with folks in the family, and they said they’d never cross the river, since only family members were allowed to know the holy secret of the famed batter. I guess they got over that or around it somehow. The newly opened restaurant in the River Market may have a much better bird than the original, but that’s purely due to the freshness of the frying oil. Gus’s also has that slaw that’s the same sort but better than old KFC—and a different but equally tasty potato salad to CBG. 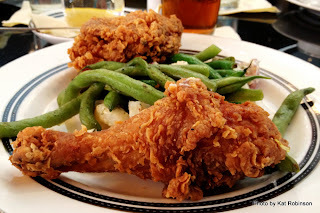 Fried chicken family style at South on Main in Little Rock. I will go out on a limb and predict that the next great mecca for fried chicken in Central Arkansas will be at South on Main. 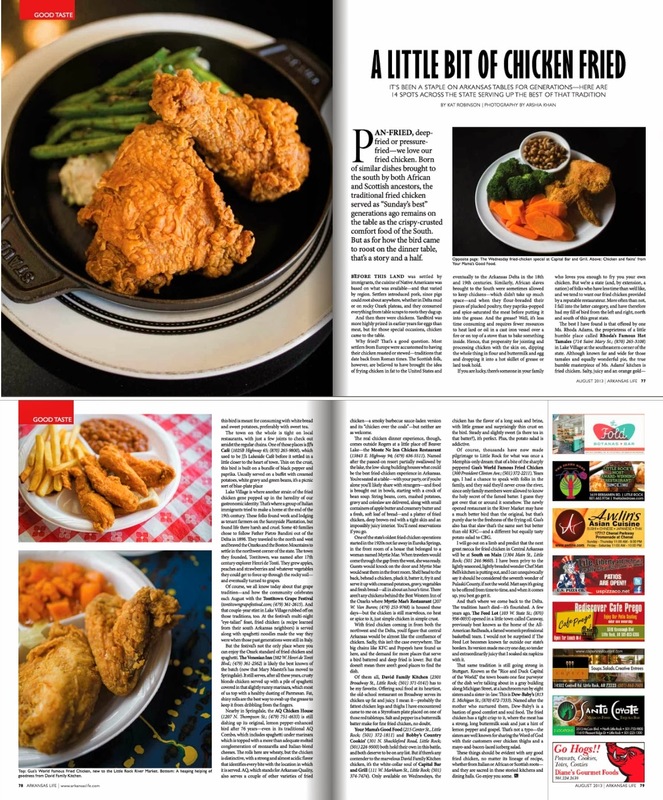 I have been privy to the lightly seasoned, lightly breaded wonder Chef Matt Bell’s kitchen is putting out, and I can unequivocally say it should be considered the seventh wonder of Pulaski County, if not the world. Matt says it’s going to be offered from time to time, and when it comes up, go. There are other places for good fried chicken. A couple lie along old Highway 64 on what some affectionately call the “diner drive,” (that might just be me, but it works). In Conway, the stop-in is at Holly’s Country Cooking, where the crust is thick, salty and sweet – yes, sweet in its own amazing way – and gone if you get there too late when it’s offered. Fried chicken dinner at The Old South in Russellville. 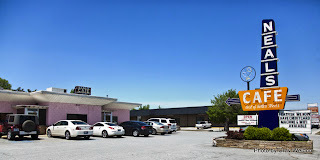 Further up the road, the old stalwart would be The Old South in Russellville. Elvis ate here, and I suspect he would have been all about the crusty, crumbly battered fried chicken that hasn’t changed a lick in decades. 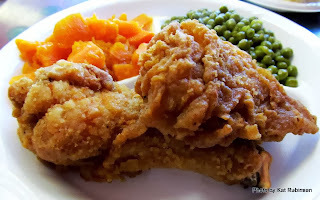 Hester’s in Hot Springs still brings folks in after all these years, even though its fried chicken is always served up on the buffet, all crusty and brown. At The Skillet Restaurant in Mountain View, it only comes to the buffet on Sundays – but the staff can’t fry up enough chicken wings to please everyone – and that’s saying something, since they order all sorts of extra wings to make things work up there. And then there’s Mama Max’s. Maxine Milner still makes up fried chicken the way I remember it – in a pan, dipped in a buttermilk and egg wash, served up crusty and brown and with fresh vegetables that have been cooked that day and never seen the inside of a can. Her chicken does what chicken should – excite the mouth with the blend of crispy and crunchy and pliant meat; fill the stomach without irritating the digestion; hearten the soul to recall the memories of a time gone past. and Red Hot apples at The Feed Lot in Caraway. And that’s where we come back to the Delta. The tradition hasn’t died—it’s flourished. A few years ago, The Feed Lot opened in a little town called Caraway, previously best known as the home of the All-American Redheads, a famed women’s professional basketball team. I would not be surprised if The Feed Lot becomes known far outside our state’s borders. 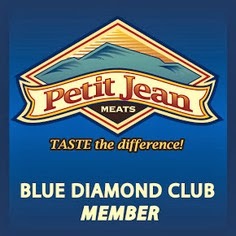 Its version made me cry one day, so tender and extraordinarily juicy that I soaked six napkins with it. The secret choice there is to get some redhot apples and corn with it, and make sure you have rolls to sop. Fried chicken at Dew-Baby's in Stuttgart. That tradition is still going strong in Stuttgart. Known as the “Rice and Duck Capital of the World,” the town boasts one fine purveyor of the dish we’re talking about in a gray building along Michigan Street, at a lunchroom run by eight sisters and a sister-in-law. This is Dew-Baby’s. Named after the mother who nurtured them, Dew-Baby’s is a bastion of good comfort and soul food. The fried chicken has a tight crisp to it, where the meat has a strong, long buttermilk soak and just a hint of lemon pepper and gospel. That’s not a typo—the sisters are well known for sharing the Word of God with their customers over chicken thighs and a mayo-and-bacon-laced iceberg salad. Mountain State Park near Morrilton. 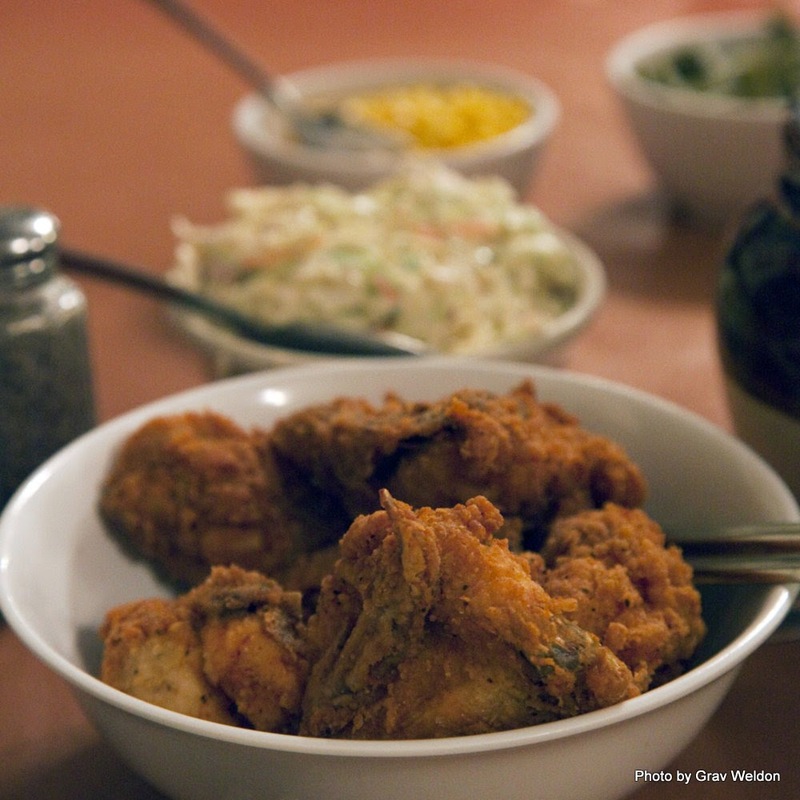 These things should be evident with any good fried chicken, no matter its lineage of recipe, whether from Italian or African or Scottish roots—and they are sacred in these storied kitchens and dining halls. Go enjoy you some. 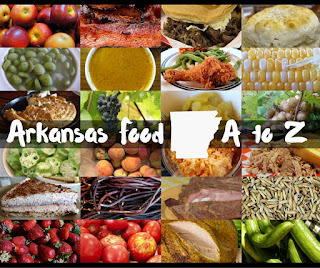 An abridged version of this piece appeared in the August 2013 issue of Arkansas Life. Thank you for writing this. It was an enjoyable read. Fried chicken is something I've always taken the time to do correctly. It's by far my favorite food and I like to cook it nearly every Sunday if I can. Fried chicken, collard greens, sweet potatoes, and buttermilk biscuits. It just doesn't get any better than that. Great read Kat! Now I am hungry for for....... yea that's right! Great read from a professional chicken graveyard . My first wife could never fry chicken. I ate fried chicken at David Family Kitchen today, and it is outstanding. Kitchen Express in Little Rock also does fried chicken right, as does Chicken Country in Jacksonville. I look forward to going to Monte Ne Inn the next time I am in NW Arkansas. I had the excellent chicken & spaghetti at the Venesian Inn in Tontitown the last time I was up that way. 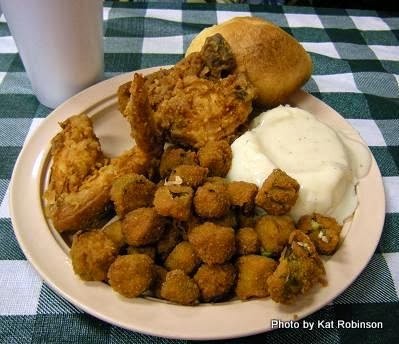 Best fried chicken in Little Rock is at Kitchen Express. Period. My mom would make fried chicken by rolling it in flour, then deep frying it. If I had known then what I know now, I would have tried to have her season it.